It seems that there are no shortage of companies today turning out flieger-inspired watches – but I believe this is the first time that I’ve come across a Canadian company making them. Today’s example is brought to us by Archer Watches. What drew me to the Aero II was the layout of the dial. On the outer track, you have the minutes taking the main stage; in a smaller dial closer to the center of the watch, you have an hour track. 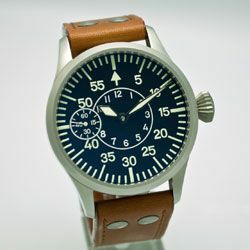 It an interesting (at least, to me) design choice, and not one I’ve seen on a lot of the flieger-inspired models lately. Of course, it’s also a handy way to explain why the hands are the lengths they are on most watches (whether or not that’s the real reason seems a little unclear in my research so far). Driving those hands around the dial you have an ETA 6947 (or 6948) movement capturing your manual winding up to a 48 hour power reserve. The movement also has incabloc shock protection, and various decorative elements. Wrapped around the movement you have a 42mm bead-blasted stainless steel case that comes in at 12mm thick and rides on a 22mm Jurgens strap. Rounding out the whole assembly you have sapphire crystals front and back, and a large crown. All together, you have a watch that’s water resistance to 50m. Of all the various pilot watches I’ve seen, this has been one of the most interesting. I’ve made no secrets about the fact that I really dig the black and brown combo found on a lot of watches these days. With the addition of the bead-blasted case, this is really a nice looking watch that has the “guts” to back up it’s presence – all for approximately $830 (at today’s exchange rates). There’s also some major credibility backing these watches up. I learned from the owner of Archer that these watches have actually seen combat on the wrists of Canadian Air Force pilots in Afghanistan – so it truly IS a pilot’s watch. About the only thing I might want to change (or wish to be able to change) would be the addition of an automatic movement, rather than manual winding. A minor quibble, though, for an otherwise sharp-looking watch. And now for one final note on the company – if you should decide to buy a watch from Archer (or have one serviced by them), I’ve learned that they photograph the work done throughout the process, resulting in a document at the end showing what all was done. For a chronograph model, this can be upwards of sixty pages! Definitely something to file away for future maintenance reference, or for use if you’re selling a watch from your collection. Previous articleWhoa, Whoa, Slow Down Gallet: Screw Lock WHAT Now? Next articleHow About A Seriously Relaxful Diver? Great looking watch – and it sounds like the company’s pretty cool too. My only comment – from personal taste – is I’d prefer the 6498 movement with its small seconds at 6:00, rather than the 6497’s small seconds at 9:00. Looks like perhaps the Aero 45 might be more to your tastes, then. Ed, you can order one with a 6498. That’s how I ordered mine. Wow – I love the minutes outside, hours inside setup. This thing is gorgeous. I have purchased an Aero 1 (with a 6498) and a (now discontinued) Executive from Archer, and also had some custom work done by him as well. Top notch stuff! Quality products and customer service that all of the ‘big boys’ can take a lesson from. John – since you’ve had some long term experience with the Archer products, how have they been day-to-day? I presently own two of Archer’s watches, including an Aero II. 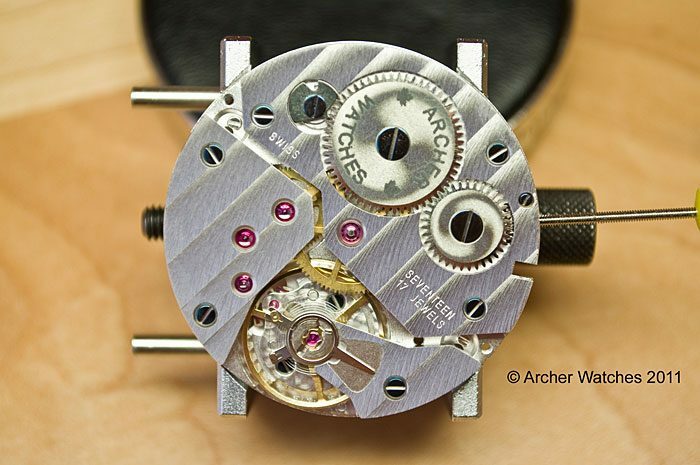 I have also had three chronos and two divers serviced and / or rebuilt by Archer Watches> The quality of workmanship, the attention to detail, the excellent customer service and the prices are all simply excellent. Al is a quality person as well as a quality watchmaker. Great stuff, Allen, at least the stuff I could understand!! !